The productivity print came in higher than expected due to gross domestic product (GDP) data coming out higher than expected. Hunter’s role at KPMG entails consulting with clients, and every CEO, CFO and CTO she meets with is focused on enhancing productivity throughout their organizations. With that focus, you would think productivity would come. Why were we in a productivity funk? Hunter believes that’s partly due to our economy’s transition to a service-based economy where things that used to count as investments in GDP are now counted as service purchases (cloud computing is an example). This is a big element of where Hunter sees spending. If this is not counted as investment in GDP accounting, this will depress productivity statistics as well. The trends in productivity from peak to trough, while averaging 1.8% over the last 50 years, often are driven by trends in labor scarcity. Constance plots this data using surveys from the National Federation of Independent Business. Intuitively, this makes sense. When labor is hard to find or expensive to find, necessity becomes the mother of invention. Hunter’s background prior to joining KPMG is a unique one—she went from an asset management and portfolio management role to serving KPMG clients and the firm generally on the big directional trends in the economy and how clients should incorporate those views into planning. She’s getting to focus on the real economy, and approaches clients from having been an investor in either their stocks or bonds. In the closing part of our conversation we spoke about her former life in asset management and how she thinks investors should apply economics to their investment decisions. GDP growth is part of a beta factor in returns; one reason why investors look to emerging markets is their faster GDP growth. For G7 economies, this may be different. Hunter looks at final sales to domestic purchasers to get a more local pulse. She also likes to look at residential construction and investment, and recently we’ve seen two quarters of declining numbers here—something Hunter will focus on more closely. We have labor shortages in construction, something Hunter sees as a red flag to watch for the next recession. 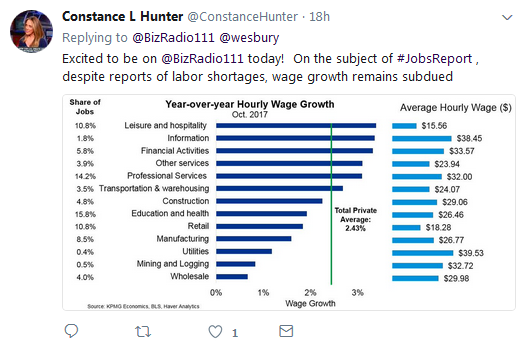 Labor shortages and increases in wages are factors that Hunter is paying the most attention to right now. Wesbury’s still bullish. Going into 2017, Wesbury was one of the more optimistic forecasters and had targets of Dow 23,700 and S&P 500 2,700. He has been largely spot-on with markets hitting those targets, which is a return of close to 20%. Wesbury’s forecasts included a belief the market was undervalued and earnings were going to grow 10%. Wesbury uses a capitalized profits model that divides trends in overall economy-wide profits and divides it by a nominal 10-Year bond rate. His forecast includes using a 3.5% 10-Year bond rate, which is 1% higher than current rates due to forces (the Fed) he sees as artificially constraining rates lower than they ought to be. Wesbury sees 10% earnings growth next year again and still sees the market at 15% undervalued, so while he hasn’t made official forecasts for 2018, he said using a base of 15% growth in the market would be reasonable. Wesbury sees 95% of recessions being caused by the Fed getting too tight. He sees this recessionary scenario as two years off given the pace of Fed hikes that would need to invert the yield curve and get short-term rates high enough to harm growth. This sets up another strong year in the markets pending the rollback in regulation and positive global growth trends. Wesbury uses a modified version of the “Taylor Rule” (moving averages of real GDP growth and inflation) to get a sense of when monetary policy is too tight. This suggests a rate of at least 3% in this cycle and maybe even 4% to invert the curve and become too tight—so we still have a way to go before we are close to those levels. Wesbury points to one of the factors supporting the markets as the drop in regulation—he has found 800 regulations have been rolled back, and we had the largest one-year drop ever in the number of pages in the Federal Register, which is where all U.S. federal regulations must be published. Every page in that journal is something Wesbury feels hinders entrepreneurs, and this drop is bullish for the economy and markets. Wesbury points out that when Reagan won the presidency, 140 other countries cut corporate tax rates. We might be experiencing pressure now to cut corporate taxes, and this corporate tax rate cutting war will be good for markets. Wesbury continues to like Europe as cheaper than the U.S. He’s also a big fan of India and Modi, and thinks this will be a market for the next decade in which to be over-weight—and my team absolutely agrees. In a big week for the economy, it was again great to speak with these two distinguished economists. You can listen to the full conversation here.